If you've ever stumbled through Pinterest's boards, you'd know that Pinners have quite a penchant for aesthetically beautiful desserts. You can find a whole spectrum of "huh?" recipes, from pumpkin zebra cheesecake to sorbet terrine with plum compote. As an amateur cook, I'm always browsing Pinterest for interesting looking foods that I can impress my family and friends with. 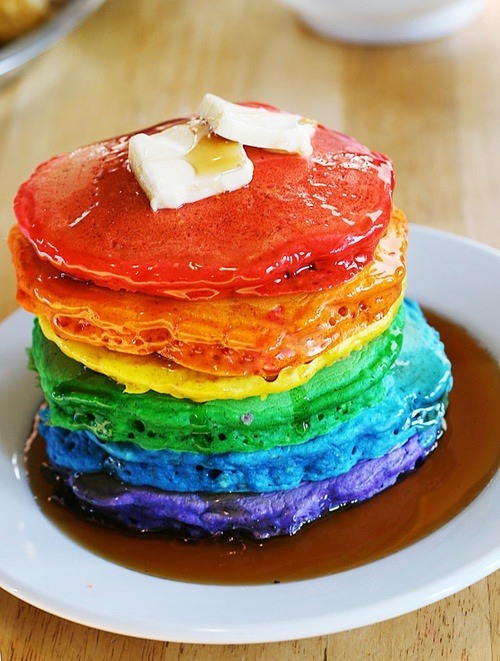 One recipe that I've ran across multiple times is rainbow pancakes. Not only do these look delicious, but they taste equally as great with every fluffy bite. If you want to try your hands at making these rainbow pancakes, here's a recipe from The One Pot Chef, which makes about 10 large pancakes. For the actual pancake-making process, check out The One Pot Chef's video below, which will walk you through it. 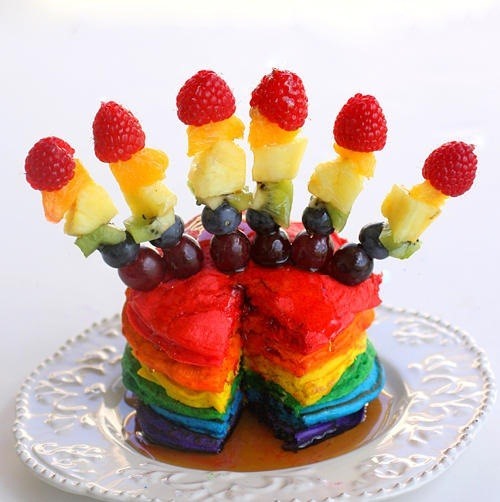 If you want to make your rainbow pancakes look even more incredible, try adding several fruit slices to your recipe. 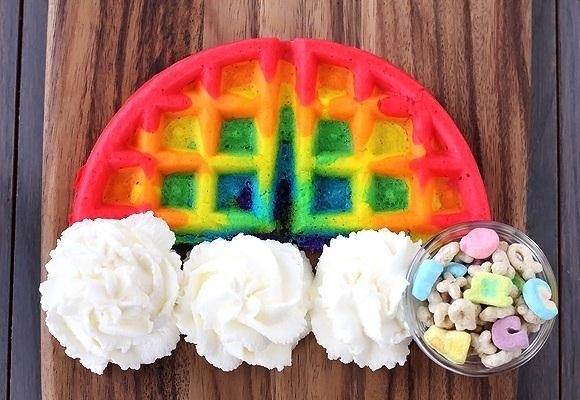 If pancakes aren't your thing, maybe you can try your hand at making these rainbow waffles from Quick Dish! 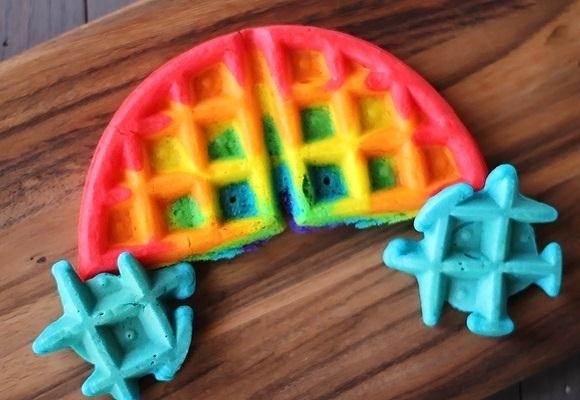 The process is pretty simple, as you'll need to mix the waffle batter with the food coloring and then place each color of batter into a piping bag or something similar. 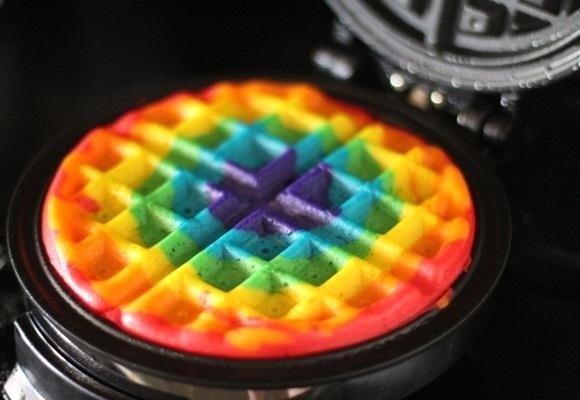 Make sure to be quick with the different colors when dropping it onto the waffle maker; if you don't do it well, the colors will mesh together. If you want to spruce up the rainbow waffles, use the blue batter to make small cloud bites. You can top it off with batches of whipped cream and use the Lucky Charms as a side plate. With color dye, the possibilities are limitless. As long as the canvas is blank, feel free to experiment with any food, even if it's not a dessert. 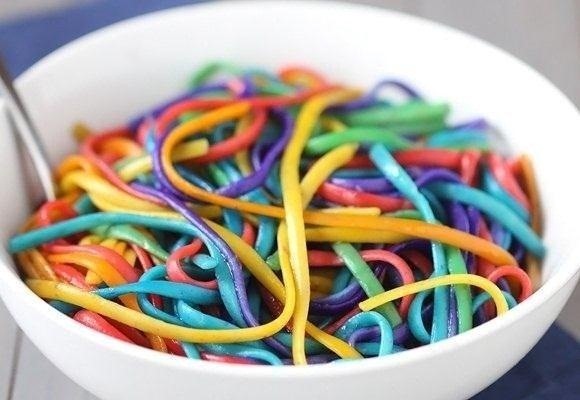 You can dye the outside of an egg, make colorful ice cubes, brighten up your cupcakes, and even rainbow-fy your pasta. Rainbows make everything taste better, don't you think? Wow cool!! I will so have a go at this tomorrow seeing it's pancake Tuesday!! !